By focusing on the field of biomedicine and healthcare, the authors engage readers in a dialogue on the ethical and social implications of recent trends in dementia research and care, advance healthcare planning, or the rise of anti-ageing medicine and prevention. Bringing together the largely separated debates of individualist bioethics on the one hand, and public health ethics on the other, the volume deliberately considers the entanglements of envisioning, evaluating, and controlling individual and societal futures. So far, the process of devising and exploring the various positive and negative visions and strategies related to later life has rarely been reflected systematically from a philosophical, sociological, and ethical point of view. As such, this book will be crucial to those working and studying in the life sciences, the humanities, and the social sciences, particularly in the areas of bioethics, social work, gerontology and aging studies, healthcare and social service, sociology, social policy, and geography and population studies. 6. Competence and Cognitive Deterioration: Are We Paying Enough Attention to Ethical Issues? Mark Schweda is Research Fellow at the Department for Medical Ethics and History of Medicine, University Medical Center Göttingen. Larissa Pfaller is Research Associate at the Institute of Sociology at the University of Erlangen-Nuremberg and currently Deputy Professor at the University of Hamburg. Kai Brauer is a sociologist and teaches empirical methods and sociology of aging at Carinthia University of Applied Sciences (CUAS). Frank Adloff is Professor of Sociology at the University of Hamburg. Silke Schicktanz is a bioethicist and Professor for Cultural and Ethical Studies of Biomedicine at the Department for Medical Ethics and History of Medicine, University Medical Center Göttingen. 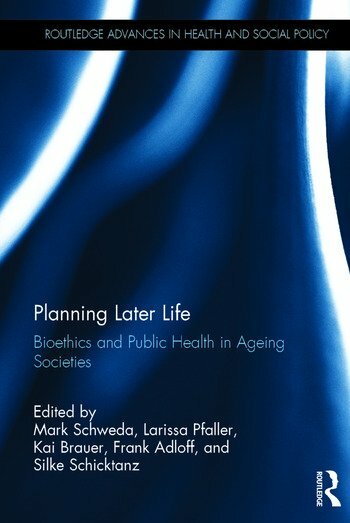 “Planning Later Life provides an accessible and well-written volume for interdisci-plinary scholars and non-scientific readers. It acquires a reasonable balance between a width of perspectives and depths of discussing the implications of an increasing life expectancy." Martin Sand, Monash Bioethics Review.